NASA’s Cassini spacecraft has provided scientists the first clear evidence that Saturn’s moon Enceladus exhibits signs of present-day hydrothermal activity which may resemble that seen in the deep oceans on Earth. The implications of such activity on a world other than our planet open up unprecedented scientific possibilities. This cutaway view of Saturn’s moon Enceladus is an artist’s rendering that depicts possible hydrothermal activity that may be taking place on and under the seafloor of the moon’s subsurface ocean. Image Credit: NASA/JPL-Caltech. 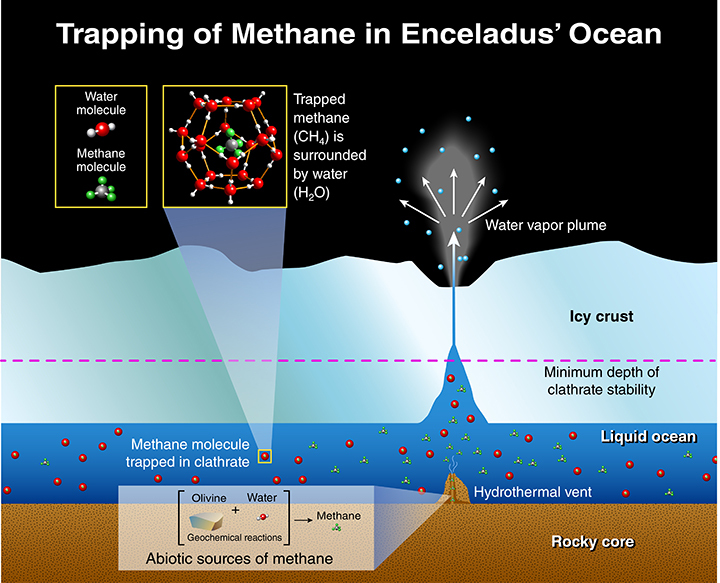 Hydrothermal activity occurs when seawater infiltrates and reacts with a rocky crust and emerges as a heated, mineral-laden solution, a natural occurrence in Earth’s oceans. According to two science papers, the results are the first clear indications an icy moon may have similar ongoing active processes. The first paper, published this week in the journal Nature, relates to microscopic grains of rock detected by Cassini in the Saturn system. An extensive, four-year analysis of data from the spacecraft, computer simulations and laboratory experiments led researchers to the conclusion the tiny grains most likely form when hot water containing dissolved minerals from the moon’s rocky interior travels upward, coming into contact with cooler water. Temperatures required for the interactions that produce the tiny rock grains would be at least 194 degrees Fahrenheit (90 degrees Celsius). 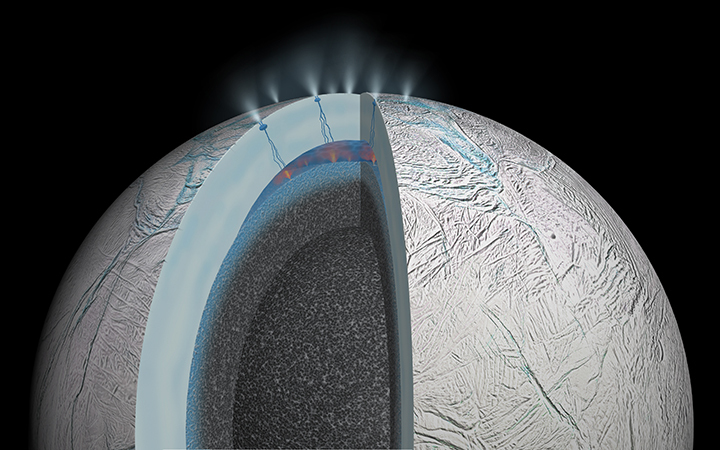 Illustration of Enceladus sea floor. Image credit: NASA. This entry was posted in Mission News, Science News and tagged Cassini, Enceladus, ice, JETS, mission, NASA, ocean, orbiter, Saturn, spacecraft, water on 2015-03-13 by Heather Dalton.